2 by 3 Heroes: Well that's odd. I've been called a lot of things, but surprisingly, I've never been referred to as "odd". I cannot remember anyone using that adjective to describe me. It's fitting, if you ask me. So are a lot of the other nouns and adjectives built in sentences where I am the subject. I think the term has fallen a bit out of favor. Sure, odd, oddball and other words with "odd" in part of the word form are still in use, but far less a description of a person and more of a situation. Besides the more common use of "not an even number", odd doesn't have much use in standard conversation. 3 - 5 - 7 - 9...we use even numbers all the time! GO TEAM!!! Around cards, though, oddballs is still a pretty well used phrase. With the explosion of the hobby in the mid 80s, everyone was getting into the card business, and some pretty strange one offs, regional, business and other, well, oddball cards were produced. Angus from the always great Dawg Day Cards (and a guy who more than understands Bears fans pain) dropped a mailer on me with a simple note. "These cards will fit better in your collection." That's just how I feel right before I mail out cards. So what kind of oddballs did Angus send? Ok - delicious vintage are not odd by any means. But I wanted to get these out of the way right off the bat. Five vintage all needed for my pre 80s Sox team sets. Though, Morales is wearing an odd uniform (reverse colored stirrups! 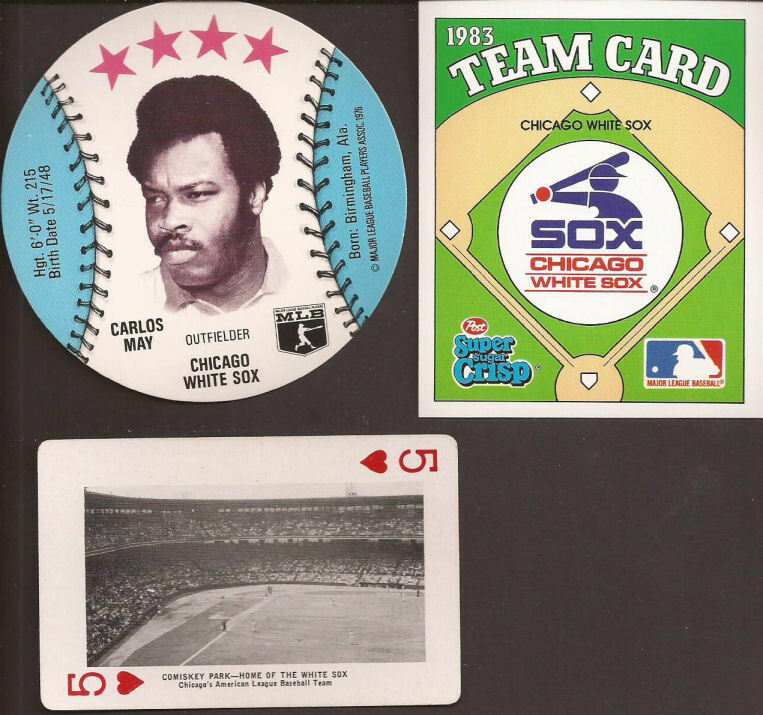 ), only appearing for two seasons at Comiskey. And I think Tommy smelled something odd. Always thought '88 Leaf was an odd set, looking exactly like '88 Donruss. Finding Leaf packs in my area was a tough search. 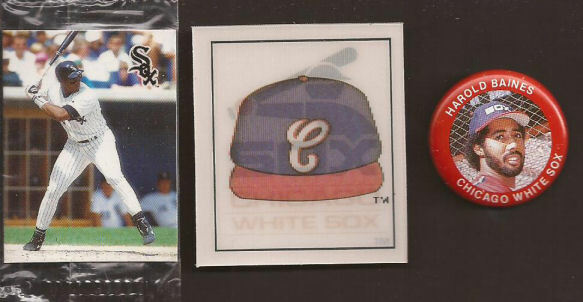 Also, how odd the Sox were in the Western Division while being the only club in said division east of the Mississippi? Ok. Now we are in full odd mode. The huge May, about 3.5 inches across, is from a restaurant called Isaly's, who invented the Klondike Bar. I ate a lot of Super Sugar Crisp as a kid (remember the bear that talked like Bing Crosby? 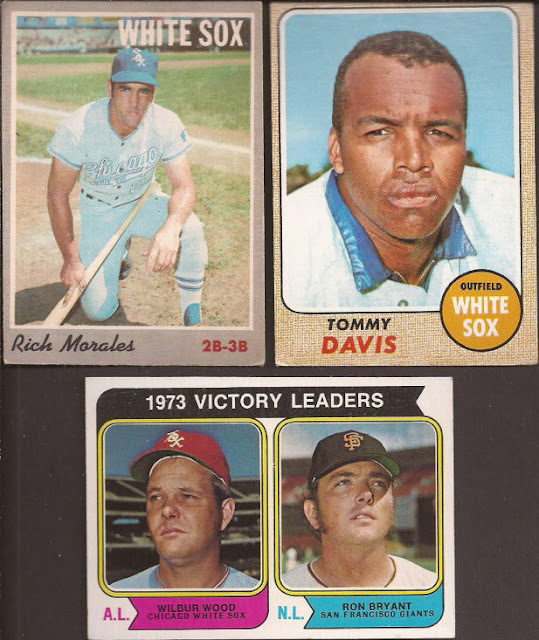 ), but I do not remember these cards from boxes. Being this is from 1983, I think I moved on to Honeycomb. Or Quisp. And the back of that playing card is a shot of Buckingham Fountain, which tells me the whole deck is Chicago related. SportFlics are always odd. The Baines pin - who thought pins would be a good idea? I guess the company Fun Foods did. And a mini, MIP (mint in package) of a Big Hurt from Humpty Dumpty. Man Angus - you ate a lot of odd stuff! 5 Sport was an odd release, but an autograph of Dustin Hermanson is not. I sent him a TTM for Project 2005, but it's been over a year now. I don't think it's coming back. So unless it does, this is a perfect addition. Lastly, there is a short story about the Carlos Garcia. Many blogs have their want lists, as well a specific cards lists. From Night Owls Nebulous 9, to Dime Boxes Dime Box Dozen. HSCA's Arbitrary 8 to Baseball Card Breakdown and his Desperate Dozen. You get the idea. 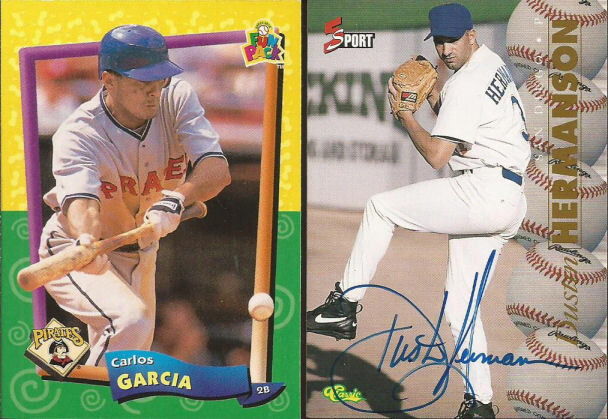 Mine is the Baker's Dozen Commons, and the Garcia you see is the card that prompted the sidebar list. In fact, you see it listed with the lowest possible odd number: 1. When I first learned of this card, I had to have it (need 2 technically), but only saw it a few times on ebay for a couple bucks with ridiculous shipping. I knew it would appear somewhere, and my hope was a reader would find that dime box and think of me. And it worked! Angus, not sure how you acquired it, but I am grateful. You are not odd, but fantastically generous. And a lot of other adverbs too. Maybe it's "odd" but I have a comment about the cereal. Remember when it was still a good thing to have the word SUGAR in the name of a cereal. And when did Sugar Crisp become "Super"? 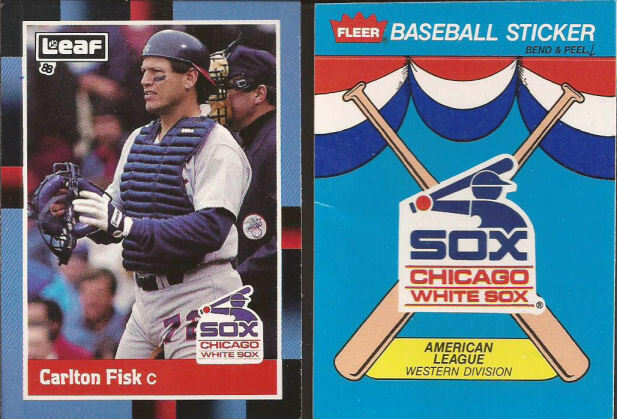 For one of the oldest teams in baseball the White Sox sure have gone through a lot of uniform changes. Man, that Garcia has a lot going on. Glad Angus found it. He is always good at finding interesting cards. My guess it has something to do with him being Canadian.